Ben Whiteman celebrates at the final whistle. When Grant McCann walked into Doncaster Rovers and promised a ‘rollercoaster ride’ it may have sounded like a mere sound bite. But he was absolutely bang on. And the latest edge-of-your-seat instalment against gallant Oldham Athletic epitomised the ups and downs of what is fast becoming a memorable campaign. There have certainly been more ups. Doncaster’s record-equalling run into the fifth round of the FA Cup only serves to highlight the impressive strides made since the Northern Irishman took charge. The last manager to guide Rovers this far - the furthest they have ever gone in the competition - was McCann's countryman Peter Doherty in 1956. Ben Whiteman opens the scoring. 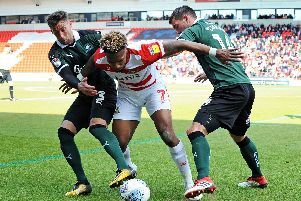 Doncaster had never before reached the last 16 having entered at the first round stage. But a thrilling win against the Latics, in what proved to be an absorbing fourth round tie, not only created a little bit of history but underlined how Rovers have kicked on. This team are not perfect, McCann has admitted that. Like any side in League One, they have their flaws. They’re still learning and developing as they simultaneously chase promotion to the Championship. But the positivity, relentlessness and also flair that Rovers now possess was again on display as they edged past their familiar FA Cup foes. Backed by a vocal 4000-strong travelling support, Oldham made life difficult and threatened to throw a spanner in the works. Rovers had an element of control but needed luck on their side, not least when it came to the decisive penalty award. After recent late trauma in the league, Doncaster almost threw this game away too. They became nervy trying to protect the lead given to them by two-goal hero Ben Whiteman midway through the second half. But this vibrant young team has personality and spirit. Like at Chorley in the first round, they overcame adversity and ultimately got the job done. It was frenetic and tense before the break. James Coppinger went close with a volley and John Marquis was denied by Peter Clarke’s goalline clearance. When Whiteman fired home from the edge of the box the intensity of the game went up another notch. Oldham had enjoyed their best spell just before falling behind and only the post prevented Chris Missilou from levelling. Rovers’ luck appeared to have ran out when Gevaro Nepomuceno's blocked free-kick fell perfectly for Clarke to rifle home with six minutes remaining. But, one week on from seeing a penalty decision for handball overturned against Burton Albion, Rovers were this time the beneficiaries when Clarke was controversially ruled to have handled. Whiteman was the coolest man in the Keepmoat to convert from the spot in the 90th minute. Clarke then left one on Marko Marosi and saw red in stoppage time. Both sides had traded blows but Whiteman had delivered the knockout punch. The FA Cup might be disregarded by some, disrespected by others. But Rovers’ brilliant cup run is only further galvanising the dressing room spirit and strengthening the feel-good mood among supporters. Those fans can now look forward to a fifth round tie next month, uncharted territory for six decades. Next up in the league are high flying Portsmouth. And then a surprise reunion with Darren Ferguson, Peterborough United’s new manager, at the Keepmoat. Get strapped in. There are plenty more twists and turns to come.